Our family, which includes our lovely Havanese, live in a small town out side of Yakima, Washington. Yakima is located 150 miles east of Seattle, Washington. 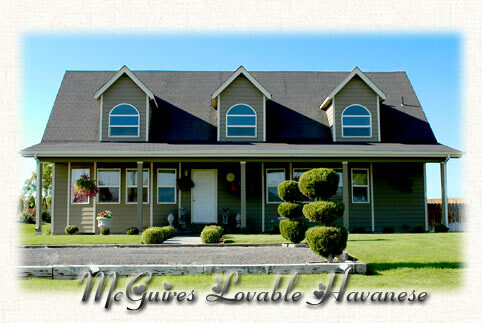 Our home is located 10 miles from town, in a country setting. On the side of our house is a fenced in area, that allows our Havanese to play safely. It is a miracle how much joy they have brought to our lives in the past years. These Havanese are so special to us that we would like to share our experience with you. We have all of our breeding dogs health tested and registered with OFA. All of our Havanese & puppies are also registered with the AKC. You can see how much pride we take in our dogs by the love, time and attention put into their health & well being. If you have questions about our breeding program or are interested in adding one of our lovely puppies to your family, please feel free to contact us. All of our soft and silky little Havanese dolls live inside the house with us. Each of them having there own little personalities, and representing the Havanese breed to the T. From their springy gates, to standing in natural show stance, to hopping like bunnies, or dancing like little bouncing clowns. Our Havanese like to lay up on the top of our furniture where they rest their little heads on your shoulder, or they like to lay in your lap or right beside you. They like to be touching you or being near to you at all times. Our Havanese are a very close and special little group. They all have wonderful little temperaments, and love each other very much. They all play together and share toys and chew bones amongst each other, and all eat and drink out of the same bowls. And yes, all of our dolls sleep with us, and its nice and cozy. I can't say enough about this wonderful breed, I couldn't imagine life with out these little stinkers!